The newest alpine delight! 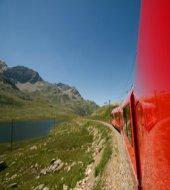 Take a ride on the Bernina Express along one of the world’s most spectacular railway routes. A UNESCO world heritage site, travel across the Swiss Alps along the Bernina Pass to the exclusive resort of St. Moritz; the 'Top of the World'. This north-south Alpine crossing offers breathtaking views and stunning scenery as you travel over boldly curved viaducts and through winding tunnels. After the train journey you will visit the exclusive resort of St. Moritz, stopping at Swizerland’s best chocolate house and enjoy free time to explore the ‘Top of the World’ before returning to Milan by air-conditioned coach. 10:00 Arrival at Tirano, free time to explore and have lunch. In the early afternoon panoramic trip onboard the famous Bernina Express (journey time around 2 and 1/2 hrs). 15.30 Arrival at St. Moritz, Chocolate house visit and free time to explore the city. English only (Tuesday, Friday, Saturday, Sunday); English and Spanish (Monday and Thursday); English and Portuguese (Wednesday).